The defending champion, Germany was this afternoon disgracefully thrown out of the World Cup in Russia. Thanks to a 2-0 win in Kazan on Wednesday by the South Korean, both goals netted in stoppage time. 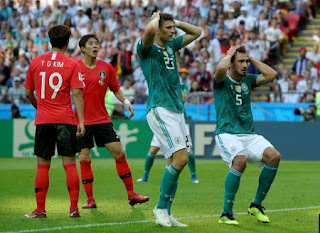 Germany briefly rallied for an equaliser, but their legs were gone and when substitute Ju Se-jong hit a long ball forward to Son, the Tottenham man was able to run in behind Neuer and rub salt in Germany's wounds with the easiest of finishes.